This isn't your normal blindfold drive. Not only do you drive a car blindfolded, but the WINDSHIELD IS COVERED WITH NEWSPAPER at the same time! People may suspect you could see through a blindfold, but how can you drive with the windshield covered? Yes, you can even have a reporter ride in the car with you and have no clue as to how you are driving the car sight unseen. FOUR DIFFERENT METHODS REVEALED! How to drive a car with its windshield PAINTED solid black. How to drive a car with a sunshade over the windshield blocking the view. Two ways to drive a car with cardboard or newspaper taped over the windshield! The Speedway Drive is taught. Learn how to drive a car with its windshield covered at speeds up to 70MPH around a speedway. This stunt can be sold to a speedway as a pre-race event for hundreds of dollars. Some of these secrets have baffled the smartest minds in magic. Some have never appeared in print before and many of these secrets are revealed for the first time. Devin holds nothing back and reveals how to do this. This book covers all the legalities of doing this. It tells you when and where to do it to prevent problems with the police. Not only is this a great publicity stunt, but this book shows you how to GET PAID HUNDREDS OF DOLLARS FOR DOING IT! The book is full of tips and ideas for adding comedy. The handcuff drive is fully explained in the book adding an element of danger to any blindfold drive. 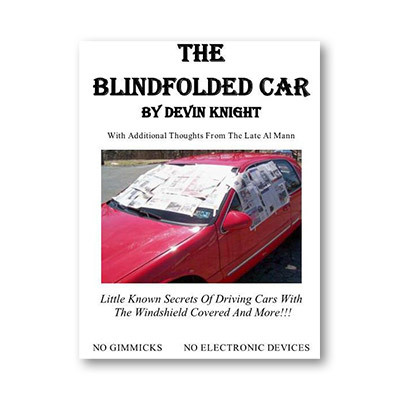 This Blindfolded-Car feat appears totally impossible, but you can learn the secrets just by reading this book. Even if you never do the feat, the secrets will fascinate you and add to your magic knowledge. NO GIMMICKS, NO ELECTRONIC DEVICES ARE USED. No special car is needed. BONUS EFFECT: Stopping A Car With Your Mind. Learn Devin's secret of letting a reporter drive your car and causing the car's engine to stall just by concentrating. Not only that you can make another car passing you STALL in the road. The secret is ingenious and NO DAMAGE will come to either car. It is revealed in print for the first time. It is a great publicity stunt that may garner you front page coverage if you pull it off properly. This is an 8.5" x 11" PDF Format ebook with 44 pages full of illustrations detailing everything you need to know. Please note these feats should only be done on CLOSED ROADS, Fairgrounds, and parking lots. These feats should never be done on open highways. This book is sold for educational purposes only. You use this information at your own risk. "I found this book to be fascinating as it gives the reader a feeling about what the real work in such feats is like. It is real, nitty gritty stuff. If you are a serious mentalist, it is something you should have in your library. You never know when you may need this information. The practicality of these feats should open your mind up to similar mentalism effects. I DO recommend this book highly." "Devin is tipping 'The Real Work' on this one, and it should be in your library if you are thinking about doing this. A definite keeper. Good work Devin and thank you for adding this to our arsenal." "The material in this book is wonderful and complete with multiple methodologies, subtleties and nuances. I would HIGHLY recommend this book to any professionals seeking a powerful and impossible effect for their next publicity stunt. It's also a perfect tome for helping to preserve these more obscure effects and nearly 'lost' methodologies."